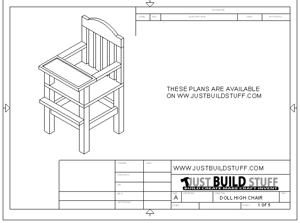 22 Comments on "Doll High Chair Plans are Released"
I think that its very nice of you to share your plans. I think my daugther would love the chair. Im going to make it for her. Thank you. Great plans,thanks. Would like to see more. Maybe a cradle.or bed. again,Thanks. Thanks I appreciate the encouragement, I am hoping to have a doll cradle plan sometime after Christmas. What size doll is this high chair for? It is for a standard size Cabbage Patch doll, but feel free to scale it as you wish. This is so perfect! I’m going to ask Grandpa to make this for my daughter this year! 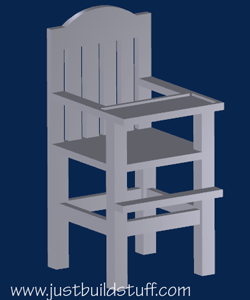 One question – how tall is the chair? The r7.000 on the headrest measurement is confusing me. Does this mean that the highest point of the headrest is 7″ from the bottom of the headrest piece? Also, did you use wooden dowels to fasten the pieces? what does R7.000 mean, at the top of the head piece? where is the center point? It refers to the arc at the top, it has a radius of 7 inches. The overall size of the arc will not be critical, just find a size that looks pleasing. I would recommend to find a round disc approximately the right size or use a thin flexible strip of wood or plastic to help draw the line. I hope to post some pictures of the chairs construction soon. Good luck on your project. I used pocket screws similar to the ones in the link below on Amazon, but dowels would work well also. Just got done building the High Chair today. It came out great. My daughter can’t wait until she can play with it. Thanks for sharing the plans! I built one for my granddaugher in Pittssburgh, turned out real nice so nice my granddaughter in Conn. wanted one. They both turned out real nice one yellow and one hot pink. 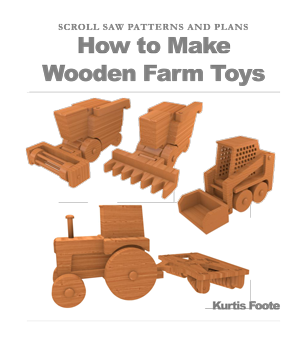 thank you very much for the plans Iam building one for my grandaughter. Assembled the chair with “biscuits” & glue. It looked good & granddaughter immediately put it to use with Christmas doll. I this plan is great. Just finished an oak rocking cradle for my daughters new baby and a Pendulum doll cradle for one of one of her 2 girls, and she mentioned a highchair for the other girl, this is perfect, thank you for sharing. I have purchased the necessary wood and cut the peces as indicated to make the highchair. I was not able to find the assembly instructions. Can you either send them to me or let me know where I can go to find them? The assembly instructions are part of the pdf. You can use either pocket screws or dowels to hold the pieces together.